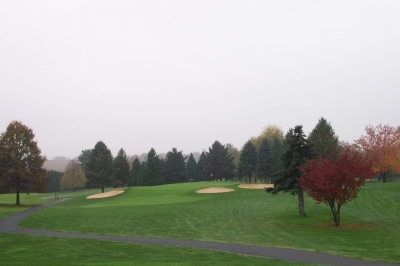 HERSHEY, PA � Golf courses are built for a variety of reasons. Some are for fun, some are for challenge, some for looks, others for practicality � your guests need something to do, right? Some special courses are built specifically to host professional events � and the best ones also manage to include some fun for the average guy along the way. Looking from behind the flag on the East Course's 9th green. Many approach shots on the East Course are uphill, and the 9th hole provides one of the toughest. 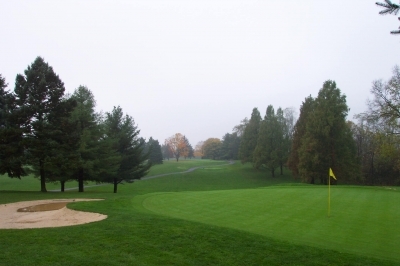 That�s the case at Hershey Golf Club�s East Course, a George Fazio (Tom�s uncle) designed layout set amongst the rolling hills of central Pennsylvania. Hear the name �Hershey� and you�re probably thinking milk chocolate, and who could blame you � the name�s synonymous with sweets the way Coke is with cola. But once you�ve journeyed to these parts and taken a gander at the surroundings, you�ll realize �Hershey� means much more than great tasting candy. In the case of its resort offerings and Golf Club, there�re some pretty fine recreational choices there, too. 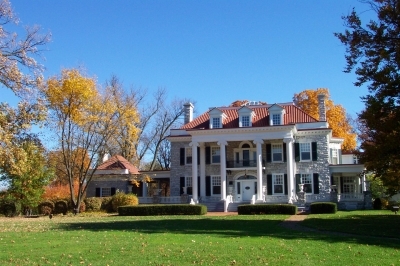 Hershey Golf Club was established in 1930 by Chocolate magnate Milton Hershey. The club�s first 18 holes now makes up the West Course, which will be discussed in a separate review -- and itself has a long and illustrious history as one of the pioneers of golf on the PGA Tour. The par three 13th is the shortest hole on the East Course, but at 187-yards, you've still got a mid to long iron in your hands off the tee. But the East Course has received the majority of �star� billing in recent times. �The players really enjoy the East�s layout and conditioning. Joe Ogilvie won the tournament (now called the Reece�s Cup) in 2003, and he compared the greens� quality to that of Pinehurst #2 during the 1999 US Open. That�s the way it is every year, and something we take a lot of pride in,� Reed added. 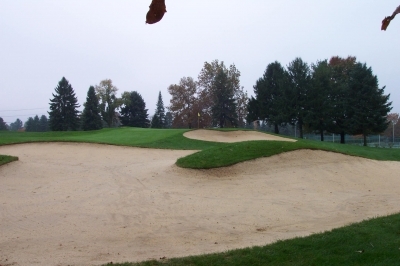 Sand is a prominent feature on the East Course, where the bunkers are big and sometimes deep. Here, looking towards the green on the par five 6th hole. 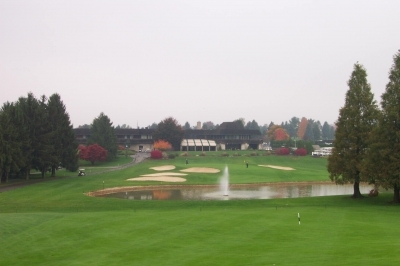 There�s no doubting the excitement that the pros bring to Hershey, though it should be noted that the 2005 Reece�s Cup was cancelled because of the ongoing construction to Hershey Golf Club�s clubhouse. The tournament organizers felt that they couldn�t offer the players and fans the amenities that they�d expect from an event of that importance, so there won�t be a 2005 version to look forward to (they�re looking into 2006 at this point). Helping to keep those playing conditions amongst the region�s finest is the fact the putting surfaces were built to USGA specifications, which basically means they have a significant sand base that drains very quickly. 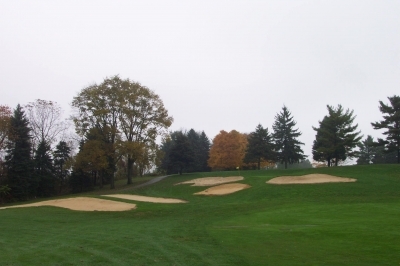 It allows for pristine conditions during the growing season, but also allows the club to stay open year-round� when there�s no snow, of course. 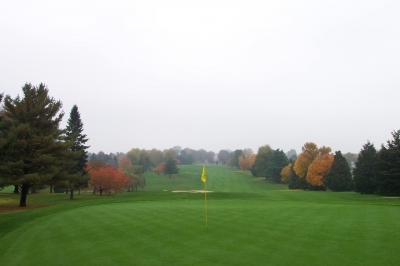 We played in late October, 2004, and the greens were in great shape and rolled very true despite being quite soggy. 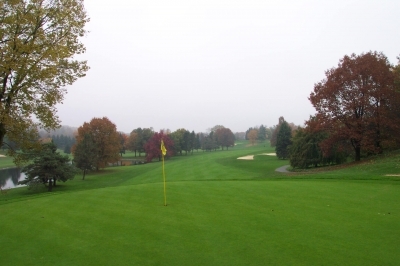 Here�s sending our kudos to the East Course�s superintendent on keeping the course in good shape despite the lack of cooperation from the weatherman. When sizing up the golf course from the tee box, you might have a hard time believing the pros have such a difficult go of it during the Reece�s Cup, because it appears to be a fairly straightforward resort course without a lot of trouble. But often times, what looks gentle can be deceiving. The East Course is certainly a second-shot golf course, which mandates good placement off the tee. The par three 16th hole is probably the one you'll remember most on the East Course -- hopefully, for making a good score. At 215 yards, that's difficult to accomplish. It looks like you can be a bit wild with the driver, but you�re taxing your abilities on the approach shots if you�re not in the fairway � take our word for it. That�s primarily because of the sand hazards. The bunkers are large and deep, allowing for tucked pins under the right circumstances. There are over 100 bunkers sprinkled throughout the course, so bring your Vokey wedge and be ready to use it. The par five 1st hole gives you an idea of what you'll see a lot of on Hershey's East Course -- uphill shots and strategic bunkering. As mentioned above, the looks of the course won�t scare you much. Most courses constructed around the late 60�s/early 70�s took into account the golf equipment of those times, and didn�t require an excessive number of carries from the tee � and that�s definitely the situation on the East Course. The vertically challenged player won�t be frustrated here, and as Reed was happy to emphasize, there aren�t any gimmicky elements set in there to frustrate you. In addition, there�s usually ample room to miss side-to-side, which will make the average resort guest happy. The rough was very thick when we played, yet it wasn�t difficult to find the ball, and then advance it in most situations. Finally, there aren�t any homes or condos along the fairways, so the East Course fits the �parkland� style to the utmost. Water also comes into play -- there are several large lakes sprinkled throughout the course that add to the aesthetics and provide for additional challenge, especially on the incoming holes, moving towards the clubhouse. 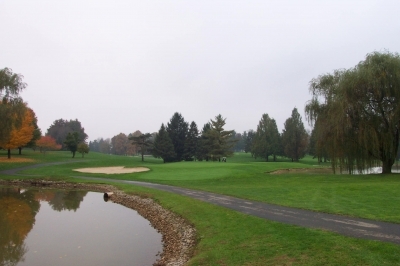 Since Hershey Golf Club is primarily private (folks staying at Hershey resort can play as well), there�s a tangible private club atmosphere to the setting, without being stuffy. Guests are welcomed and treated as members, and that only adds to the good time out on the golf course. The new clubhouse will be nothing short of spectacular, with a large pro shop, locker rooms and meeting facilities for members and guests as well. Trees line most of the golf holes on the East Course, but there's still plenty of room side-to-side. True to Reed�s statement, the back set of tees at 7061 yards (par 71) will give you all you can handle, with seven par fours measuring at least 420 yards � the longest being the incredibly difficult fifteenth hole, at 467 yards. The middle tees are much more manageable at 6363 yards, reducing the lengths of those par fours to friendlier distances. We couldn�t play the layout from the back tees in the conditions we encountered, which basically added 20 to 30 yards every hole because of the heavy air and wet turf grass. Because of their length and set-up, four of the East Course�s holes play particularly difficult for the professionals on the Nationwide Tour, year after year. The group claims bragging rights as four of the top twenty on Tour � not bad when one golf course can put that on the wall. And you won�t find them any easier when you tee it up, either. That notorious quartet includes the 458 yard, par four seventh hole; the 224 yard, par three eighth hole; the 467 yard fifteenth hole and the 215 yard sixteenth hole � pars four and three as well. The 540 yard, par five 14th hole. Definitely a three-shot hole on a cool and wet day in October. One common trait with all of these links is the straightforward need to drive it a solid distance and be able to hit long irons into well protected greens. If you can do that, then you�re already ahead of the game! The front nine�s par fives will provide birdie opportunities to help soften the sting of its most challenging holes. The first hole measures �only� 500 yards and doglegs right around a lake � which provides a risk-reward opportunity from the start to cut off some distance if you dare. The second shot�s to an elevated, well protected green. The sixth hole is a bit longer at 554 yards and a slight dogleg left � but provides a wide landing area for tee shots and ample room on the potential lay-up for a wedge shot in. Take advantage, as the front nine�s toughest two holes are right ahead of you. On the back, again, the two holes the pros have fits with will probably be the ones you�ll remember, too � the fifteenth and sixteenth holes. The fifteenth�s tee shot plays downhill, but the second shot will test everything you�ve got. The sixteenth requires a long iron from an elevated tee with water on the right and a large bunker to the left. From in back of the par three 2nd hole. The final hole is also a good one, a testy 456 yard par four with the second shot over a lake with the clubhouse as the backdrop. If you miss the fairway off the tee, you might consider laying-up � or else that water looks awful dangerous. By that standard, we think you�ll agree, the East Course is plenty well thought of, indeed. It's a grand view from the fairway of the 18th hole -- and it's a challenging shot, too. As is true on most of our initial visits, a good deal of our time was spent checking on the golf courses � but that doesn�t mean there�s only golf at Hershey Resort. In fact, golf is only scratching the surface of what�s there. We stayed in the Hershey Lodge, which offers 665 guest rooms including 28 suites. Upon checking in, each guest in your party receives -- what else, a Hershey chocolate bar. The Lodge is decorated to pay homage to Hershey�s rural Pennsylvania Dutch Heritage, with high post and beam ceilings, exposed stonework and comfortable furniture in the lobby and guest rooms � and the buildings all have �chocolate� themed names. Finding your room is a bit of an adventure at the Lodge, we must say � and for anyone who�s ever visited the Sarah Winchester house in northern California, you�ll feel right at �home� within the confines of the Lodge�s hallways. But it�s all part of the unique charm of the place, and there�s plenty of help to point you in the right direction (and unlike the Winchester house, no ghosts!). For those desiring the full-luxury Hershey Visit, there�s the Hotel Hershey, with 234 deluxe guestrooms and 27 suites, including the Milton Hershey Presidential Suite. Designed in a Mediterranean style, Mr. Hershey wanted the Hotel Hershey to rival the finest hotels in the world. The hotel now includes the Hershey Spa, where you can purchase a wide variety of chocolate inspired treatments that sound delectable as well as soothing. Families will certainly want to head to Hershey Park, which is a short drive from the Lodge and Hotel Hershey � where there�s plenty of fun and sweets for the kids, and a plethora of wild roller-coaster adventures for the daredevils amongst you. 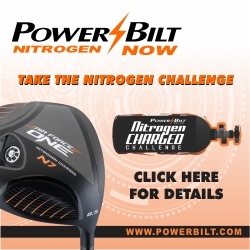 If hitting shots into 215 yard par threes over water isn�t enough to get your blood flowing, try riding one of those metallic monsters, and you�ll experience a surge of adrenaline that even a fighter pilot would have a hard time matching. If you�ve got time leftover, the Lodge offers three swimming pools, a health and fitness center (with whirlpool and sauna), basketball, tennis and volleyball courts and an 18-hole miniature golf course on site. Needless to say, there�s also a wide variety of eateries to choose from, and the desert menus are some of the best around. We�d certainly have to rate a visit to Hershey high up in the overall entertainment category. Months later, the kids can�t stop talking about Hershey Park, and the golf and accommodations are good enough to merit serious consideration for a visit. As always, for more information, we suggest checking out the website: http://www.hersheypa.com/. For resort guests, $99 � for either the West or East Course. Additional packages include spa visits and activities. 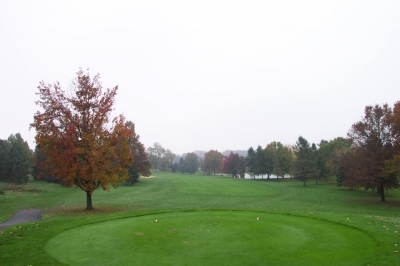 Note: Additional golf is available at two public access courses in Hershey � Parkview Golf Course (public, built in 1929) and Spring Creek Golf Course (a 2,318 yard, par 33 course, originally built for junior golfers). Greens fee, range balls, cart and all taxes are included in the fee.